Room for growth at Abcam? As we approach the announcement of Abcam’s end of year results in September, our latest data report looks at how the company has done historically, how it is currently performing, and what the future might hold. Abcam, a Cambridge, UK based company operating on a global scale, has seen steady growth over the last 20 years, with its last few financial reports being strong and its most recent interim results showing a continuation of that trend. Here at CiteAb we have analysed hundreds of thousands of citations for individual antibodies in order to make a prediction ahead of the company’s full year report in September and to outline where there might be room for Abcam to grow. Looking at the data, a long term positive trajectory is apparent for Abcam. There has been a 10 per cent growth in the company’s share of citations from 2015 to 2016. In its December 2015 interim report the company reported an 8.1 per cent increase in reported revenue in core antibody sales, which broadly aligns to its citation increase. 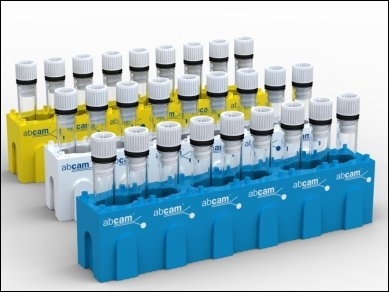 Abcam is now the number one supplier for polyclonals – the most used antibody type, and is in a strong position for monoclonals which which are showing increasing use. In addition, the company has cracked China, now claiming 25 per cent of the world’s fastest growing market for research antibodies. Andrew said: “This data clearly suggests that Abcam should be expecting very strong full year results in September”. So importantly, is there still room in the market for Abcam to continue to grow? Andrew tells us: “Abcam has seen less success in the US market than it has in Asia, claiming just 16 per cent – lagging its share in other countries and remaining behind Cell Signaling Technology. The USA remains the world’s largest research antibody market, and while Abcam has seen growth here over recent years there is clearly an opportunity for the company to focus its marketing, aiming to expand its share and take the lead from Cell Signaling. “Additionally, Abcam is strong in rabbit monoclonal antibodies, the antibody type fastest growing in demand, but again sees itself well behind Cell Signaling Technology. Further analysis of CiteAb data shows that in the top 30 antibodies used globally, only one is from Abcam, while Abcam also only provides the most antibodies for three of the top ten protein targets. There is also an increasing focus on antibody validation (see our blogs) which is likely to put more pressure on companies like Abcam with large numbers of antibodies. Abcam has responded by instigating initiatives such as the KO initiative but this is an area where they’ll need to ensure they stay ahead. Of course many of you reading this blog from other fast growing antibody companies will be trying to take share from Abcam – check back in September when our next market report is out highlighting these.